Mosquitoes transmit serious and sometimes fatal diseases, such as the West Nile virus, to humans, horses, and their pets. West Nile virus emerged in the United States in the New York metropolitan area in the fall of 1999. 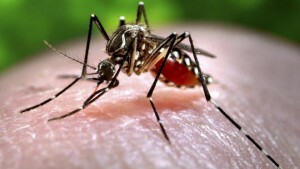 Since then, the virus, which can be transmitted to humans by the bite of an infected mosquito, has quickly spread across the country. In Illinois, West Nile virus was first identified in September 2001 when laboratory tests confirmed its presence in two dead crows found in the Chicago area. The following year, the state's first human cases and deaths from West Nile disease were recorded and all but two of the state's 102 counties eventually reported a positive human, bird, mosquito or horse. By the end of 2002, Illinois had counted more human cases (884) and deaths (67) than any other state in the United States. Mosquitoes become infected with the West Nile virus when they feed on infected birds and can then transmit the virus to humans and animals while biting to take blood. The West Nile virus is NOT transmitted from person-to-person. Is there a vaccine available to protect people from West Nile virus? No. Currently there is no West Nile virus vaccine available for people. Many scientists are working on this issue, and there is hope that a vaccine will become available in the future. How soon do people get sick after getting bitten by an infected mosquito? The incubation period is usually 2 to 6 days but ranges from 2 to 14 days. This period can be longer in people with certain medical conditions that affect the immune system. Severe symptoms in a few people. Less than 1% of people who are infected will develop a serious neurologic illness such as encephalitis or meningitis (inflammation of the brain or surrounding tissues). The symptoms of neurologic illness can include headache, high fever, neck stiffness, disorientation, coma, tremors, seizures, or paralysis. Recovery from severe disease may take several weeks or months. Some of the neurologic effects may be permanent. About 10 percent of people who develop neurologic infection due to West Nile virus will die. Who is at risk for serious illness if infected with West Nile virus? Persons over the age of 50 as well as persons with certain medical conditions, such as cancer, diabetes, hypertension, and kidney disease are also at greater risk for serious illness. Certain animals also can become ill when infected with West Nile virus. For example, horses exposed to West Nile virus can develop encephalitis. Also, certain birds – particularly crows and blue jays – can become ill and die with West Nile virus infection. What should I do if I think a family member might have West Nile virus disease? Consult a healthcare provider for evaluation and diagnosis. How is West Nile virus disease diagnosed? Diagnosis is based on a combination of clinical signs and symptoms and specialized laboratory tests of blood or spinal fluid. These tests typically detect antibodies that the immune system makes against the viral infection. What is the treatment for West Nile virus disease? 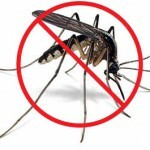 There are no medications to treat or vaccines to prevent West Nile virus infection. Over-the-counter pain relievers can be used to reduce fever and relieve some symptoms. People with milder symptoms typically recover on their own, although some symptoms may last for several weeks. In more severe cases, patients often need to be hospitalized to receive supportive treatment, such as intravenous fluids, pain medication, and nursing care. When do most cases of West Nile virus disease occur? Most people are infected from June through September. The carrier of West Nile virus, the Culex mosquito, flies only 1-3 miles and females search for small stagnant and organic puddles of water to lay their eggs. Every 7-10 days, a new hatch of mosquitoes can be produced from these eggs in an area of stagnant water. 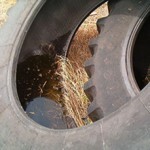 Remove standing water to reduce mosquito populations! Tightly cover or store buckets inverted as to not collect water. 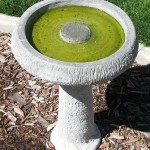 Stock ornamental ponds with mosquito eating fish or use mosquito larva control products. *If you have questions about the frequency of mosquito treatment in your area, contact your local municipality. Most mosquitoes bite at dusk or at night, but some kinds will bite during the day. Almost all mosquitoes will try to bite you if you enter an area where they are resting. DO NOT rely on insect light traps ("bug zappers"). They do little to reduce biting mosquitoes in an area. 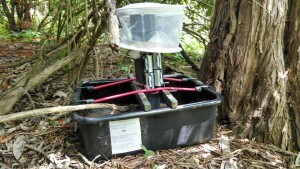 The Kendall County Health Department conducts a multi-faceted mosquito surveillance program trapping and testing Culex mosquitoes for the West Nile Virus. 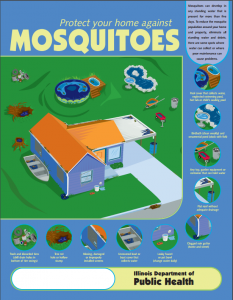 The Environmental Health Services unit sets mosquito traps placed throughout the county beginning May 1st through October 1st each year collecting and testing samples on a weekly basis. 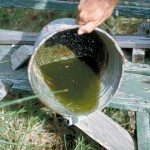 Areas of stagnant water are also investigated throughout the season for the presence of mosquito larvae, specifically from the Culex mosquito which is the primary carrier of West Nile in Illinois. Finally, the locations of dead birds are monitored to assist in the assessment of potential West Nile virus activity. The Health Department works closely with the municipalities, townships, and the Kendall County Forest Preserve in monitoring the mosquitoes that may pose a public health threat. To review Kendall County West Nile Virus surveillance data, please click here. The Kendall County Health Department may collect perching birds (not limited to crows, blue jays, robins, grackles, starlings, sparrows) for its West Nile virus surveillance program. These birds are very sensitive to West Nile virus and they can indicate the presence of West Nile virus in an area. The bird is dead, but the carcass is in good condition. Birds should be dead no more than about 24-48 hours prior to collection, and should not show signs of advanced decomposition (maggots, strong odor, dried or deflated eyes). The bird shows no sign it died of causes other than disease. Birds with obvious injuries such as wounds or missing parts or birds that obviously flew into a window should not be submitted for testing. Likewise, crushed carcasses and birds found along roadways are not acceptable. The bird must be a one that is acceptable for testing. 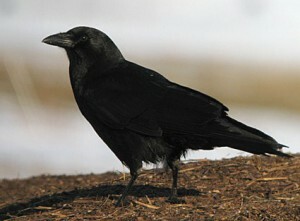 Some acceptable species are crows, blue jays, grackles, starlings, robins, cardinals, sparrows, finches, hawks and owls. Birds that will not be accepted include pigeons, ducks, geese, chickens, other large birds and endangered species. Please reference the Illinois Department of Public Health Bird Identification Resource for help in determining bird species. *Contact 630-553-8026 to report a dead bird. Please Note: Your health department will determine if the bird is acceptable for testing and will pick up acceptable birds. Note that local health departments are authorized to collect a limited number of birds each season (May 1 to October 15). The decision to accept a bird for testing also is based on the bird’s locality. For example, when one or two birds from the same place have tested positive for West Nile virus, there is often no need to test additional birds from that city or locale. To view comprehensive, State-wide West Nile virus surveillance data please visit the Illinois Department of Public Health Website (State Surveillance).